The EnviroDisc utilizes a framework to support the removable media. The shaft is a 30" diameter, 3/4" thick wall. This is the largest shaft available and is structurally superior to any other in the marketplace to provide a rugged design capable of an extended fatigue life. 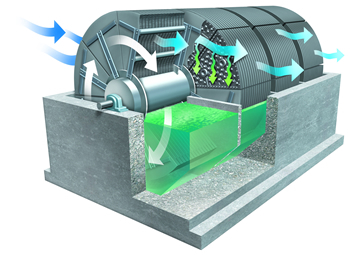 The EnviroDisc also utilizes either a direct or a shaft-mounted drive. Shafts are available in 11' 10" diameter, 26'0" nominal length, in both 100,000 square feet and 150,000 square feet media area, and also several shorter lengths for small plant applications. October 2011: This paper discusses the viability of RBCs as an alternative to other processes for BOD removal and Nitrification application and addresses some of the issues raised by those who are cautious about this technology. Williams, S.E. (williams-works.com) Energy usage comparison between activated sludge treatment and rotating biological contactor treatment of municipal wastewater. [PDF] May 2012. Williams, S.E. (williams-works.com) Reconsidering Rotating Biological Contactors. [PDF] January 2011. For information about rehab and retrofit on all types of RBCs, click here or visit www.rbcservicesinc.com.